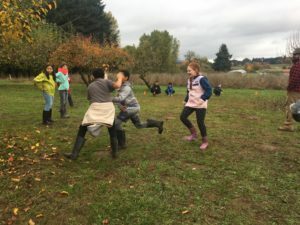 Fall 2018 – a great season! It’s finally reached that time of year… as we tour the garden with students, identifying which stage of their life cycle our plants are in, we find that most have entered the “death” stage; we’ve been tasting mustard greens and kale for weeks out on the farm; and we find ourselves putting up more and more canopies to guard from the rain. We are closing in on our second to last week of the field trip season, and it’s been another great one! We’ve added “Decomposition Tag” to our Soil and Compost module this year. It’s been a great success, nothing better than getting kids moving AND learning about decomposers at the same time! Planting cover crop in the Grow Lunch Garden has been so exciting – students love to contribute to the garden, and many even want to take home a seed or two to plant at home. 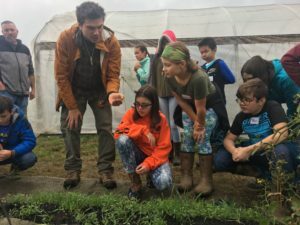 Schools that came to us later in the season even got to see cover crop seeds planted in earlier weeks start to sprout – what an amazing way to learn hands on about plant life cycles! We’ve also had some non-elementary school visitors out on the farm this season. 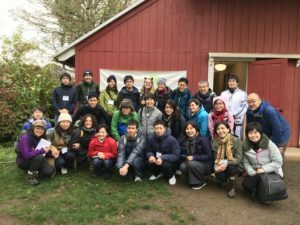 On Halloween, we hosted educators from Japan, who came to visit Portland State University to learn about – and experience firsthand – inquiry-based learning. They were able to spend a day on the farm shadowing one of our field trips, and had a great time. We were thrilled to host them, and share our inquiry-based approach to teaching! For more photos from the farm this Fall, check out our Facebook album! http://www.sauvieislandcenter.org/wp-content/uploads/2017/02/SIC-logo-web-340-300x125.png 0 0 Emma Guida http://www.sauvieislandcenter.org/wp-content/uploads/2017/02/SIC-logo-web-340-300x125.png Emma Guida2018-11-09 02:12:222018-11-09 02:12:22Fall 2018 - a great season!